Winners announced in sixth Free From Skincare Awards! I'm taking it easy at the moment so forgive the laziness of relying on press releases but my brain isn't properly back in gear following my surgery. My goodness it was a trip on the pain medication but I'm off them now and feeling a lot better. So anyway, I'm here to give a shout out to my favourite awards. Yesterday the winners were announced for the Free From Skincare Awards, finally I no longer have to keep that secret as I knew the winners in some categories from helping with judging. I dragged my bum off the sofa put on some proper clothes (jeans not pajamas) and roped in my hubby to drive me up to the Love Natural, Love You show so I could see the presentation. Cornish body and skincare brand Bloomtown took the prestigious Best Free From Brand Award, while Honesty’s Protect Nourishing Cleanse Balm won the Free From Achievement Award. Among the 14 category winners were Rosalena’s Beauty & The Beast Face Oil, Green People’s Scent Free Shampoo, Living Naturally’s Oat Milk & Calendula Soapnut Soap, and Nyasa London’s Pure Glow Cleansing Balm. 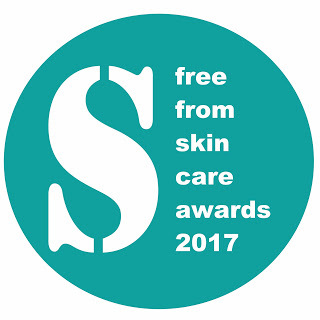 A full list of all Gold, Silver and Bronze winners can be viewed over at freefromskincareawards.co.uk. I definitely recommend viewing this website as I regularly use it as a shopping list for finding new products. I already have my eye on a few! I won't be writing up about the Allergy & Free From Show this year as I only spent about half an hour there before closing. My hubby did a whizz round and stocked me up with some of my favourites. I didn't want to push myself plus I'm suppose to be careful about lifting things, like I said it was my first day off the sofa exactly a week from my operation. As always I love your comments, let me know if you visit the shows over this weekend or if you have spotted something on the winners list to buy.